Marek was very excited to take part in the massive transformation of the Henry B. Gonzalez Convention Center. This contract was one of the largest in San Antonio history and we were very happy that Hunt-Zachry awarded Marek the opportunity to take part in a project that means so much to our city. The new construction and remodeling of the Convention Center was the largest capital improvement project in San Antonio history. The expansion included more than 800,000 square feet of new construction and 78,000 square feet in renovations. That alone is pretty impressive; but what’s even more impressive is the fact that these renovations occurred during business hours and in occupied space. Business was not disrupted by the construction and remodeling process. The expanded, state-of-the-art convention center houses exhibit space, multi-purpose areas, multiple meeting rooms, and the largest ballroom in Texas. The plans for the convention center were aimed at reenergizing and revitalizing the 46-year-old facility. The 325 million dollar expansion project focused on flexibility and sustainability to create a convention center that is able to showcase San Antonio’s vibrant downtown culture. We believe it does all of that and more. Marek began working on this project in August of 2014 and finished the main construction in January of 2016. Marek had up to 162 men and women working on this project at one time. With ceiling heights ranging from 38’-55,’ the use of lifts was necessary, and Marek’s well trained team was paramount to ensuring the job was done safely and efficiently. Throughout this project, we installed over 95,000 sq ft of Eurospan. This is the largest amount of Eurospan that we have installed to date. 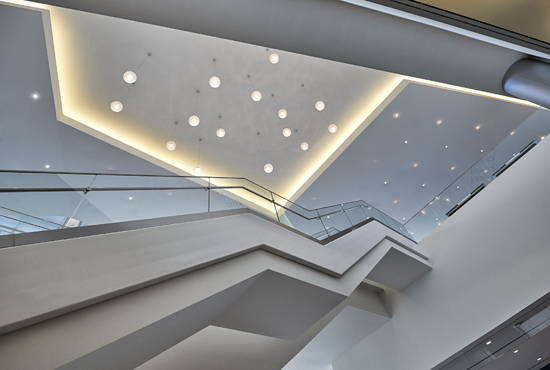 This stretch system is a seamless acoustical solution designed for ceilings and walls of any space. Virtually any wall or ceiling can have outstanding acoustical performance, without the traditional look of fabric-covered panels. Eurospan was installed in the pre-meeting areas, lobby, registration area, and ballrooms. If you get a chance, make sure to check out the Stars at Night Ballroom. It’s a 54,000 sq ft meeting area and can seat more than 3,000 people. 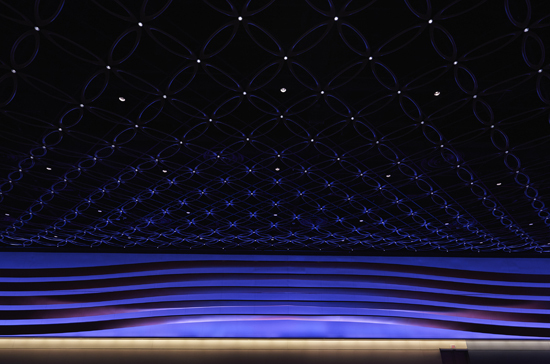 The ballroom was designed to draw inspiration from the beautiful Texas night sky. The ceiling is accented by 1642 programmable LED lights that provide sparkling ambience and is sure to wow you. 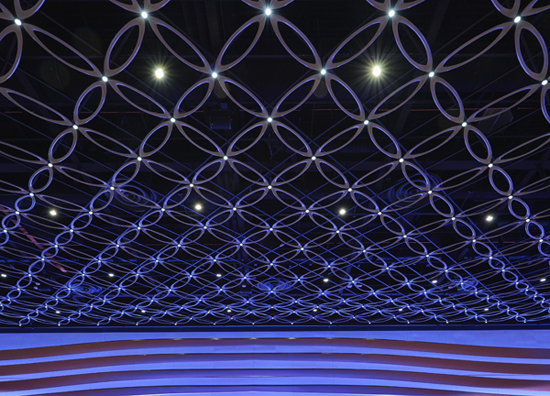 The ceiling is comprised with custom metal grillwork whose pattern is a modern interpretation of the classic quatrefoil symbol of San Antonio. Marek’s ceiling department was instrumental in installing this custom ceiling system from Arktura. The ballroom is truly a remarkable sight, if you happen to be in the area I would encourage you to visit. 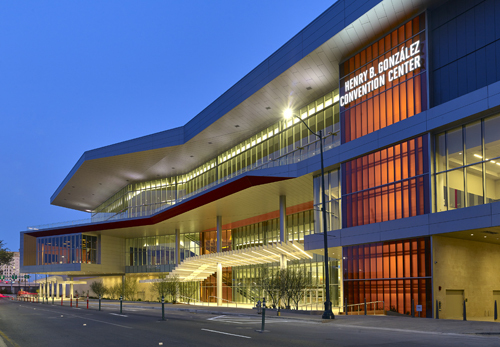 All of the work that was done to the Henry B. Gonzalez Convention Center has helped transform San Antonio into a premier location for corporate and industry-related conventions and conferences. It is now the prime convention and conference venue, hosting close to 300 events and more than half a million visitors annually.